Mealworms have made headlines as food items lately (mealworm tofu, anyone?) but these beetle larvae—which are rich in protein, amino acids, potassium, and iron—may be even more remarkable for what they are capable of eating. New findings from Stanford researchers, in collaboration with researchers in China, found that mealworms can subsist on a diet of Styrofoam and other forms of polystyrene. This is great news for mealworms, as it means they can feast on the 33 million tons of plastic Americans throw away every year, but it also has potentially large implications for the future of the recycling industry. This is because microorganisms in the mealworms' guts biodegrade the plastic during the digestion process. For years, previous studies suggested that the degradation of plastics like Styrofoam may take decades or hundreds of years. Published in Environmental Science and Technology, the experiment involved giving 100 mealworms a small pill-sized portion of Styrofoam to eat every day. The researchers found that the worms converted half the Styrofoam into carbon dioxide—same as they would with any food source—and the rest was excreted within a day as "biodegraded fragments that look similar to tiny rabbit droppings." Wei-Min Wu, a senior research engineer in the Department of Civil and Environmental Engineering at Stanford, said that the mealworms that ate the Styrofoam were as healthy as those on a normal diet after a month, and their waste appeared usable for soil. Wu told Fusion that this 24-hour "degradation" is very rapid and that "for years, previous studies suggested that the degradation of plastics like Styrofoam may take decades or hundreds of years." The plastic being produced is far greater than the natural environment can handle. "Our findings have opened a new door to solve the global plastic pollution problem," Wu said. "The plastic being produced is far greater than the natural environment can handle. The accumulation of waste plastic in soil, landfills, rivers and especially in oceans has accelerated very rapidly." He elaborated that recycling businesses could possibly engineer the enzyme that the mealworms are using to decompose the plastic, or simply use plastic as a feedstock for worms. Styrofoam is a kind of polystyrene; a non-biodegradable, synthetic polymer that can take decades, or even centuries, to deteriorate in a landfill or other environmental setting. According to the EPA, every year Americans throw away around 25 billion Styrofoam cups. 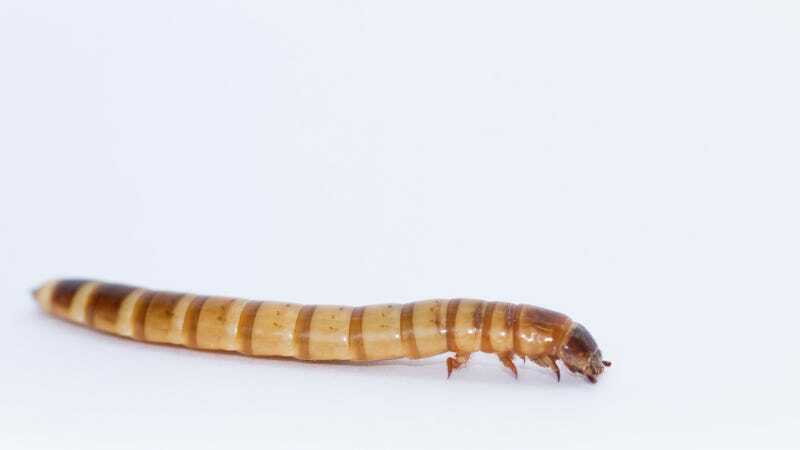 Otherwise known as Expandable Polystyrene Foam (EPS), Styrofoam can get into animal digestive tracts, and the results are not as promising as with mealworms—just the opposite in fact. Douglas McCauley, a marine biology professor at the University of California, Santa Barbara, recently told the BBC that polystyrene foam can get lethally lodged in animal intestines. "If you think about how we worry about a mild blockage from eating the wrong thing, imagine eating a ball of Styrofoam," he said. McCauley elaborated that when animals such as sea turtles or fish eat polystyrene foam, they are basically eating "pollutant sponges," and that these very creatures "may be ending up back on our tables." One recent study found that man-made pollution, such as Styrofoam, is now found regularly in fish and bivalves being sold for human consumption. The study found "anthropogenic debris" in a quarter of individual fish sampled for sale in California markets and around one-third of sampled shellfish. Mealworms are a good alternative food source for humans. Mealworms can "recycle" Styrofoam by eating it. Some three million tons of Styrofoam are produced in the U.S. each year, 2.3 millions tons of which ends up in landfills and waterways. Marine animals eat discarded portions of this Styrofoam, some of which then gets passed on to human food sources.